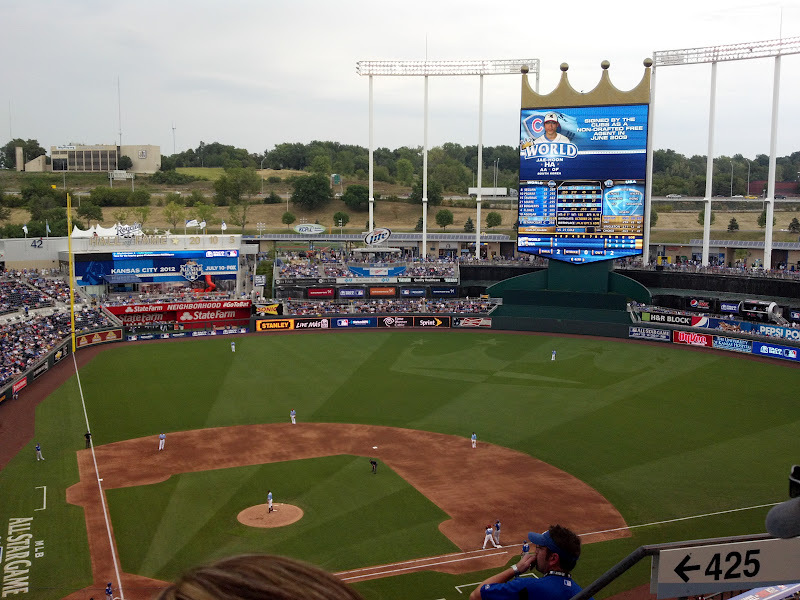 Last night, while watching the Home Run Derby, ESPN did a tour of Kauffman Stadium. 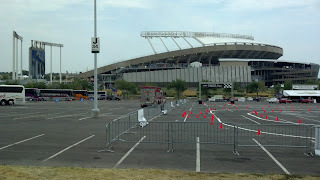 It was so cool to be watching the tour...and the Derby less than 24 hours after having been at Kauffman Stadium myself! As I mentioned yesterday, I was ecstatic when The Pilot was assigned a long overnight in Kansas City during MLB All-Star weekend. Sure, we wouldn't be able to stay in town for the Home Run Derby and the All-Star Game, but it was super exciting to be part there for all of the festivities over the weekend. I didn't have $300+ to spend on tickets to the Derby and the ASG anyway. We were still able to check out the stadium by going to the MLB Futures Game - an All-Star Game that pits the top Minor League prospects from each team against one another on teams representing the US and the World. Kauffman Stadium is about 20 minutes outside the city. We picked a great weekend to go because there were free shuttles running to and from the stadium every 15 minutes. I have no idea how we would have gotten there if it hadn't been All-Star Weekend. 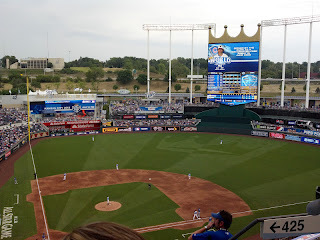 From the outside, Kauffman Stadium is nothing to write home about. Built in 1973, it's one of the oldest stadiums in Major League baseball, but a recent major renovation that was completed in 2009 revealed a pretty nice stadium. We weren't sure if we'd be able to make it to the game given that we had to flight out that night but we were able to by Standing Room Only seats for pretty cheap once we got there. Our legs were both dead from the race and being on our feet all day though so we made our way to the Upper Deck where we found seats rather than standing through the game. I don't know the stats on this but Kauffman Stadium has got to have one of the biggest scoreboards in baseball. It's certainly the biggest I've ever seen! The stadium was pretty expansive...I learned from yesterday's ESPN tour that the average length of the fences is longer than the average in the MLB by some 12 feet...making it an interesting place for the Home Run Derby! We did our standard, walk around, checked out the Hall of Fame and visited the Team Store...which I was disappointed to see sold All-Star Game gear and only All-Star Game gear despite the fact that about 200 tents and makeshift kiosks had been set up throughout the park to sell All-Star Game gear. Luckily, I found someone who broke the rules and decided against hiding all of the Royals' gear who I was able to buy my souvenir pin from. Neither of us were too hungry when we got to the stadium, so unfortunately, we didn't dig into the plentiful food offerings Kauffman had to offer...and it was tough to get a feel for the stadium since it wasn't typical Royals game but there was a great turn out and it was a lot of fun to watch some of the League's top prospects duke it out. We saw some pretty amazing plays. We had to leave after the 4th inning to make our flight which was a bummer but just as we left, the US team...which was being destroyed by the World, started to make a huge comeback that resulted in them crushing the World 17-5. The Pilot and me at the entrance to the stadium. We wore our Mets gear to support Mets' prospects Zach Wheeler and Wilmer Flores...I would otherwise never wear Mets gear to a stadium when the Mets aren't playing. It's against my principles. So there you have it...Kauffman Stadium, home of the Kansas City Royals. 18 down, 12 to go! I always love reading about the ballparks you visit! It seems like it was an exciting time to visit and I'm glad you were able to find a pin. Kauffman stadium's scoreboard is second largest. The biggest is in the new Yankee stadium, which I'm sure you saw at your graduation? 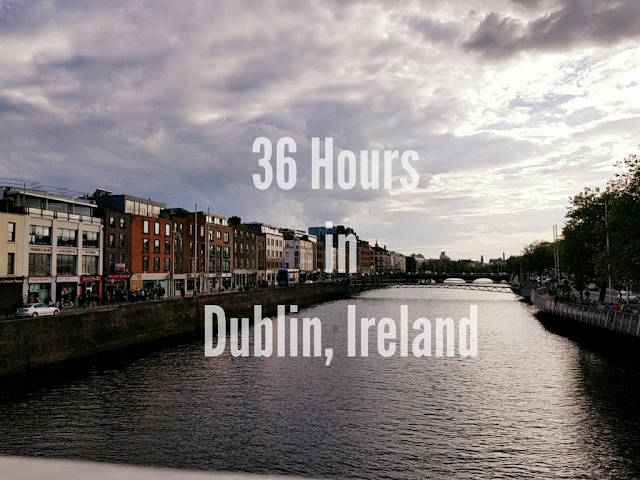 The third biggest you will be seeing in two weeks! FYI the fountains are way more impressive at nighttime.